The Facebook user thought he'd be "creative rather than kicking off". Let's face it. We Brits are absolutely terrible at complaining, even when we're in the right. 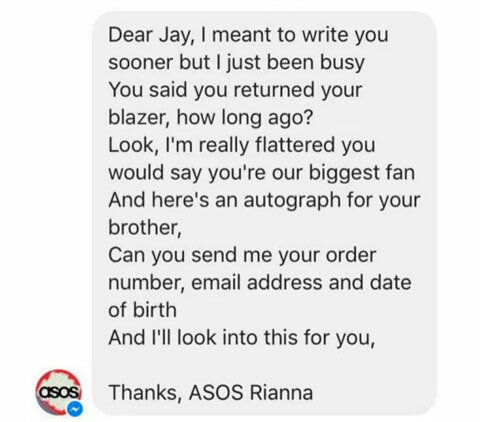 But, when Facebook user Jay Whalley was yet to receive his correct order from ASOS, he decided to have a little fun with it and complain in the style of Eminem's Stan. However, what he didn't expect was a response from ASOS customer service staff member, Rianna, who replied in a similar fashion. She writes: "Look, I’m really flattered you would say you’re our biggest fan/And here's an autograph for your brother," before asking for his email address, date of birth and contact number.